What strategic and tactical management can you use to help meet your forage requirements for different livestock targets? The likelihood of meeting critical livestock targets (e.g. fat score at joining, late pregnancy or during lactation). Rainfall is the most commonly collected data on-farm, but it is also one of the least understood and used statistics. Analysis of rainfall, even in the short-term can reveal trends that defy current management, necessitating changes. Average rainfall values are useful for explaining the general limits on pasture production and livestock enterprises, but variability of rainfall both between seasons and between years is a key feature of this region. Production levels in rain fed pasture systems are directly correlated with the timing and amount of available soil water and the efficiency of its use. Therefore, rainfall variability is a fundamental risk, which producers need to understand and include in their management. Climatically, Northern NSW is classified as sub humid with a summer dominant rainfall distribution. The wettest months are December and January and the driest, April, May and August. Sixty-percent of total rainfall occurs from November to March, but rainfall effectiveness during that period is low due to high evaporation rates and losses through surface runoff. Rainfall effectiveness is greater during winter (50-55% of rainfall is stored) compared with summer (25% is stored), which means winter rainfall is important for replenishment of reserves of stored soil water. 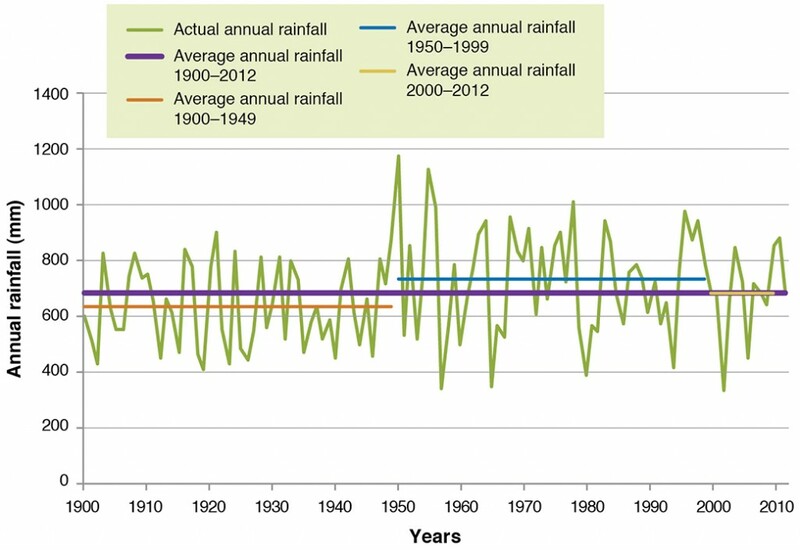 Analyses of short- and long-term monthly and annual rainfall data for sites in northern NSW (Warialda, Barraba, and Tamworth) indicated that since 2000, rainfall in autumn has been substantially lower, and spring-early summer has been substantially wetter compared with the long-term mean. Since the end of the last century rainfall patterns in northern NSW have shown a trend to lower annual rainfall totals. Associated with these lower annual rainfalls is a consistent pattern of below average monthly rainfall in January, May July, August and September and above average monthly rainfall in October–December, which has prompted changes in sowing times for forages and the choice of pasture species. These weather patterns have profound implications for livestock production, since adequate May rainfall is required for the germination of annual, winter-growing legumes and late sown cereal forage crops, while November–December is a critical period for seed production of annual legumes, sowing and establishing tropical perennial grass pastures and the growth of summer-growing native perennial grasses. However, there is little documented information in this region on past climate variability and its likely effect on animal production. Drought is the most serious expression of climate variability and its impact varies from north to south in NSW (Fig. 1). Analysis of rainfall records for last century shows a significant increase in annual rainfall in the second half of last century (Fig. 2).The SGS Pasture Model was used to analyse long-term rainfall data across four sites, which showed a high number of exceptional droughts (those lasting >364 days) in the summer rainfall zone of northern NSW compared with environments with a more Mediterranean type of climate (Lodge and Johnson 2008). In northern NSW, analysis of rainfall records for the last century showed we need to be prepared for extreme variability. In these analyses, a predicted drought occurred if there were more than 50 days of a soil water deficit for plant growth. Droughts were classified as; seasonal (those lasting 50−120 days), intermediate (121−150); days; moderate (151–180) days; severe (181–200 days); extreme (201–364 days), and exceptional (>364 days). There were 90 predicted droughts at Albany, WA and Hamilton, Vic, all starting and finishing in the same or consecutive years and 65 predicted droughts at Wagga Wagga, NSW. Barraba, NSW only had 60 predicted droughts, but 16 of these were classed as exceptional (Fig. 1). Figure 1. 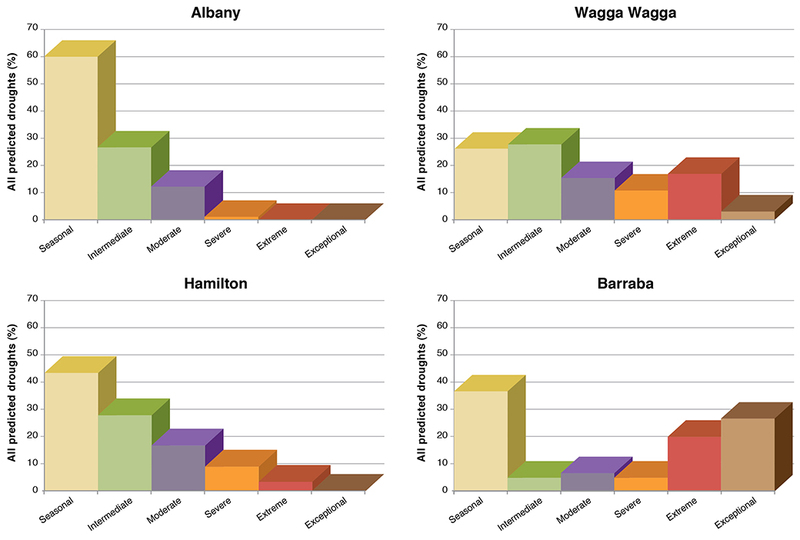 Distribution Predicted drought frequency from 1900–99 at Albany, Hamilton Wagga Wagga and Barraba, using the SGS Pasture Model (after Lodge and Johnson 2008). Figure 2. Distribution Actual annual rainfall (mm) and average rainfall for different periods at Barraba, NSW from 1900 to 2012, showing 1900-49 was drier than 1950-99. A further analysis of rainfall across last century showed a consistent pattern that indicated impending dry seasons. The long-term rainfall record from 1889 to 2010 for Tamworth in northern NSW, reveals an average annual rainfall of 675 mm per year. However, for Tamworth the average amount of rain received in summer (December, January and February) is 34% or 227 mm, of the total rainfall, rather than the 25% you would expect if it was evenly distributed among the 4 seasons. This indicates the importance of summer rainfall to total annual rainfall. This raises the question – if summer rainfall is above or below average is it likely that the total rainfall for the year will be above or below average? If total rainfall during the summer months is less than 227 mm then the average annual rainfall in that 12 month period (December to November) was below average in 82% of years. That is there was a better than 80% chance that the remainder of the year may be drier than average. Conversely, if the rainfall in these three months exceeded 227 mm than there was a 72% chance that rainfall for the year would be above average. So based on a drier than average summer there is a good chance that the rest of the year will be dry. Therefore it is possible to know at the end of February with a reasonable probability (82%), whether or not that year may be dry. Lodge (2005) demonstrated the strong links that occur between summer rainfall total and predicting a dry year ahead, with this method identifying 10 of the 10 drought years (less than 452 mm per year) encountered or 100% of the drought years and 100% of the very dry years (6 of the 6 years with 452-506 mm per year)! The fundamental objective of a pasture system is to efficiently capture rainfall and use available water from the soil water store to generate growth of plant dry matter for livestock to consume. Soils vary in their water holding capacity and so their ability to supply water for plant growth. We need to know what our soils are capable of so that we can manage pasture growth. Soil water holding capacity is defined as the amount of water a soil can hold for pasture or crop use. This capacity is affected by texture, soil organic matter and the soil depth. When a soil profile is holding the maximum amount of water it is said to be at field capacity. Plant available water capacity (PAWC), measured in millimetres (mm) is the amount of water held in the soil between field capacity and wilting point. Wilting point is the point where most plants cannot extract any more water. There are many publications that can assist you in estimating PAWC for your soils (e.g. GRDC “Estimating plant available water capacity”, 2013). Water can be lost from the soil through runoff, evaporation, transpiration and deep drainage. Management is needed to address these losses. To reduce runoff and increase water availability, ground cover needs to be maintained at a minimum of 70%. Steeper lands will require the higher levels. Evaporation of stored soil water from exposed soil surface is a non-productive pathway of soil water loss. High litter mass (1500-3000 kg DM/ha) can reduce evaporation by up to 1 mm/day, allowing plants greater opportunity to access stored soil water. Losses of soil water through deep drainage to the aquifer system are episodic in nature, occurring in response to prolonged periods of rainfall. Stored soil water records show that full profile wetting is a relatively rare event in northern NSW and occurs most often in winter-spring, preceded by a wet summer. However, deep drainage can be important to recharge alluvial aquifers, which are an important source of water. In northern NSW, the rainfall capture efficiency is greater during winter (50-55% of rainfall is stored) compared with summer (25% is stored). Therefore, rainfall is more effective during winter months compared with summer months. Correspondingly, stored soil water is often at its highest at the end of winter and lowest in late-summer and autumn (Fig. 3). Transpiration represents the productive use of stored soil water. Forage plants need to be actively growing, supplied with sufficient nutrient and have green leaf area to transpire. In well managed pastures, transpiration may be up to 50-55% of annual water budget. In northern NSW research has determined PAWC for Red Chromosol soils to be up to 180-200 mm for a soil profile with a depth of 2.1 m. Long-term simulation studies show that soils are commonly driest at end of autumn, with little or no PAWC. Soil water records have shown that during the spring and summer growing season, levels can reduce from field capacity (FC) to wilting point (WP) in just 6-8 weeks, when evapotranspiration demand is 3-5 mm/d. Knowing how much soil water is available to forage plants allows us to anticipate the amount of plant dry matter that should be produced in the short to medium term. Figure 3. Distribution of monthly rainfall for three centres on the Tablelands and North-West Slopes (LHS) and trend in total stored soil water for native pasture at Gowrie, near Tamworth (RHS). Livestock enterprises are faced with the challenge of growing sufficient quantity and quality of forage for livestock in a landscape that has a variable climate/rainfall pattern. Forage species need to be responsive to availability of soil water at different times of the year in the variable climate. With increasing climate variability there have been many losses of what were once productive pasture systems. 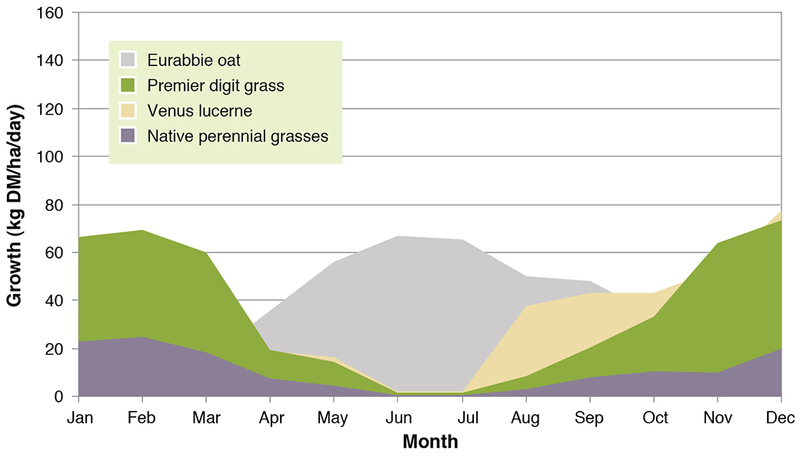 The value of integrating a range of forage sources across the farm can also be illustrated using daily pasture growth rates (Fig. 3, Murphy et al. 2010). These data demonstrate that a forage system which combines Premier digit grass (November to March), Eurabbie oat (May to September) and lucerne (September to November) could provide growth >50 kg DM/ha/d for 11 months of the year. fat score targets and energy requirements of each animal class in the livestock enterprises. using a simple spreadsheet to calculate target livestock numbers. Strategic changes for increasing utilisation and managing variability. In a variable climate, such as northern NSW, the pasture base needs to incorporate a proportion of both winter and summer active forages in order to fill the winter-early spring feed gap for green feed and to take advantage of rainfall in whatever season it occurs. This can be done by determining the proportion of paddocks with native perennial grasses, sown grasses and legumes, and forage crops required according to the livestock enterprise being run. Again, a simple spreadsheet calculator can be used to compute changes in required pasture types/areas, timing of reproduction and stocking rates. Each livestock type and class has specific forage requirements that need to be met in order for growth targets to be reached. The following graphs reveal at what times of the year that ewes require forage of certain quality and quantity in order to reach goals. Benchmark fat score targets for breeding ewes show that peak condition is required at joining (Figure 5), but the greatest demands for green dry matter are during late pregnancy and lactation (Figure 5). Breeding ewes require adequate levels of green dry matter during late pregnancy to maximise lamb survival, ensuring adequate lamb birth-weight, and the ewe remains at the birth-site at lambing (see EverGraze Exchange – Lamb survival). During lactation, adequate green feed is required to meet lamb growth and development targets of the lamb while maintaining ewe condition prior to joining. The benchmark values of green dry matter are 1200 kg DM/ha for those in the last month of pregnancy and 1700 kg DM/ha for lactating ewes (Figure 5). Figure 5.Merino ewes need to be in peak condition at joining, but also require 1700 kg DM/ha of quality green dry matter to meet lamb growth and development targets while maintaining ewe condition prior to re-joining. Herbage mass is for a native perennial grass pasture with a mix of both C3 and C4 grasses with 68% digestibility. Based on known forage quality and seasonal growth rates for both C3 and C4 native perennial grasses, most native perennial grass-based pastures cannot meet the digestibility, protein and energy requirements of breeding livestock, unless their use on-farm is integrated with other forage sources such as over-sown sub clover (Trifolium subterraneum), lucerne (Medicago sativa), sown temperate or tropical perennial grass-based pastures, forage oats (Avena fatua), or other forms of supplementation (Table 1). The combination of forages shown in Table 1 illustrate how these options can be used to supply required green dry matter during the critical stages of late pregnancy and lactation. Table 1. An example of how forage types can be integrated to meet animal requirements for growth through out the year in northern NSW. The manager should develop his/her own trigger points for essential management activities that are important to handle the effects of climate variability. If rainfall during summer (December to February) is less than the long-term average (227 mm) there is an 82% chance rainfall for the rest of the year will be below average, and so a strategy needs to be in place early. The contributions of our forages, across the feed year, are driven by climate and soil moisture. Therefore, managers need to consider at any given point, what is my next best forage option for feeding livestock and if it is not coming from pasture or forage crop, then what are other options do I have around feeding, supplementation, or selling? There are critical points across the breeding cycle for livestock and we have focused on fat scores for sheep, but similarly they have been developed for beef cattle.The critical fat scores for ewes are at joining, late pregnancy and lactation. The trigger points for action must be well before reaching the required target so that tactical management can be implemented. Climate, soil moisture and forage options will impact on our livestock strategy. Remember for a Merino ewe of 40 kg, a fat score unit represents approximately 7.5 kg in body weight.